A Super Swim Pole is ideal for the whole family. It’s a great way to teach the kids how to swim, remembering that one of the purposes of the Super Swim Pole is to aid you in swimming straight. It also helps you to swim on top of the water. Another advantage is for those who have a varied stroke in their swimming this tethers you to the rear of the spa by means of a cord and a pole and restricts you from swimming into the jets. Sometimes you will find that you just want to swim without water in your face. 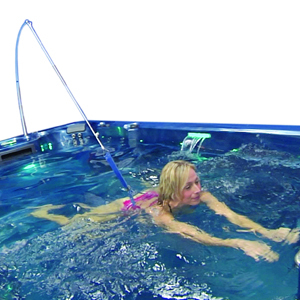 Simply place the Super Swim Pole into the fitting provided, strap Super Swim harness around you waist and start swimming. Its that easy!